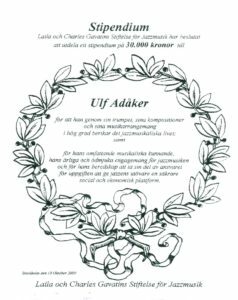 Trumpetaren, kompositören, arrangören och pedagogen Ulf Adåker tilldelades 2000 ett stipendium från Laila och Charles Gavatins Stiftelse för Jazzmusik "för att han genom sin trumpet, sina kompositioner och sina musikarrangemang i hög grad berikar det jazzmusikaliska livet; samt för hans omfattande musikaliska kunnande, hans ärliga och ödmjuka engagemang för jazzmusiken och hans beredskap att ta sin del av ansvaret för uppgiften att ge jazzens utövare en säkrare social och ekonomisk plattform". Trumpeter, composer, arranger, writer and educator Ulf Adåker, born in 1945 in Stockholm, has been active on the Swedish jazz scene for over 30 years. As leader of the fusion group Egba, established in 1971, he has played at most of the Scandinavian jazz clubs and festivals as well as touring many countries. He has composed most of the tunes on the nine albums with EGBA that were issued 1974-89 and he has played with the Swedish Radio Jazz Group lead by, for instance, George Russell, Mike Gibbs, Anthony Braxton, Bob Brookmeyer, Terje Rypdal, Tony Coe, Lars Sjösten, Örjan Fahlström and Per Henrik Wallin. He was also commissioned to write three works for the Swedish Radio Jazz Group of which two, Chordeography (1986) and Café International (1992), have been issued on record. After a commission from The Swedish Broadcasting Corporation in 1999 Ulf performed a new piece at the Berwald Hall in Stockholm titled Odyssey of Karib. Ulf Adåker has also frequently been heard with his own ensembles, large and small, and he has also taken part in recordings with a long list of prominent artists. African rhythms, jazz harmonies, big band power and the pulse of rock are just a few of the musical Lego pieces that Ulf Adåker has succeeded in assembling into ever-surprising forms. Ulf Adåker is active as an educator in several areas, perhaps most notably at the Royal College of Music in Stockholm, where he has been teaching since 1984. He is also chairman of the Association of Swedish Jazz Musicians (FSJ), a position he has held since 1989. Ulf started playing the trumpet at an early age and at that time he used to play together with his friend, tenor saxophone-player Tommy Koverhult. They studied jazz magazines and started buying records of Parker, Miles, Dizzy and Monk. It felt natural to him to begin playing in the bebop tradition. He sat in at jam sessions with good, experienced musicians such as tenor saxophonist Bernt Rosengren and pianist Bobo Stenson though, at that time, they played at a far higher level than he did. It took him many years to be a master of his instrument. In the 60's Ulf studied at a higher commercial school and after that he started studying law. It never entered his mind that one could support oneself as a musician. He continued playing very frequently even though he wasn't a regular member of any band. However, when Egba started in the beginning of the 70's, everything else had to take second place. A career as a lawyer was no longer interesting to him. He toured and played at small clubs in Sweden and Denmark instead of swatting civil law. Egba came on the scene at the dawn of so-called fusion music and the band became the spearhead and the flagship of that genre in Sweden, their repertoire, mainly composed by guitarist Jan Tolf, containing mixed elements of rock, Latin American, jazz and African music. Egba was a new experience for Ulf and an important development musically as well as instrumentally. Fusion meant playing more modally and was easier to grapple with. Ulf found that he could liberate himself from a lot stylistic demands. The band discovered a new energy, another way of playing that felt very natural. The music took a firm hold of the listeners and even made people start to dance. That was something new and different from concert situations and the immensely serious attitudes that often characterized Swedish jazz at that time. The music became more light-hearted and the band communicated with new audiences. Although Egba was contemporary with the times, it wasn't uncomplicated to break the social patterns of music. Some within the musical movement of the 70's thought that Egba played too much jazz and, simultaneously, some jazz people thought that the band didn't convey the traditional expressions of jazz music. -"During a period we could play at jazz clubs and at rock places as well- that was the optimum bonus of our style," says Ulf. For many years Egba also was a kind of breeding ground for young musicians whose backgrounds were in jazz as well as rock music. For example, saxophone-player Ulf Andersson member (and even co-leader) of Egba for many years could easily adapt himself to different genres and play very well in all kinds of connections. He was a rock to have in the band and reliable as a musician. How about Ulf's previous musical preferences which manifested themselves in Egba's music of the 70's and 80's? "I don't listen very much to fusion nowadays. It has lost some of its attraction but that doesn't mean that there isn't still some good stuff today. I enjoy listening to the old Weather Report and I'm confident that it's something that by and by will experience a renaissance. When you go back and listen you really find a lot of good music there." For many years Ulf has been teaching at the Royal College of Music in Stockholm. "Teaching is a way of surviving and at the same time keeping in touch with the music you love. And it is stimulating to have students who really find that their relationship to music is something that is personal to each and everyone. 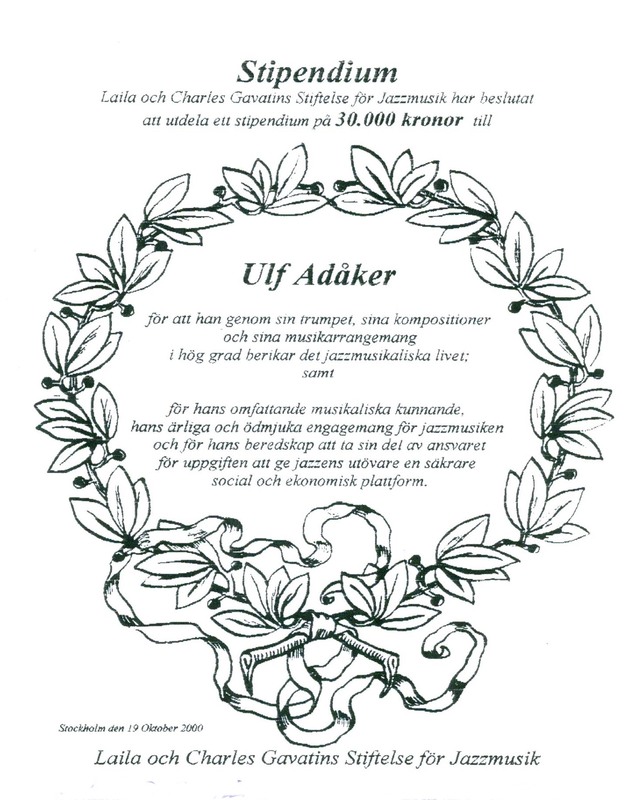 In October 2000 Ulf Adåker received a scholarship from Laila and Charles Gavatin's Foundation for Jazz music. TMcCD 023 Who Are You?